Posts Tagged "Podcasting & Radio"
We’re closing out the first week of the 12 Days of Giveaways with an awesome gift from John Lee Dumas! You can get his giveaway here. John knows a thing or two about launching a podcast. Within one year turned EntrepreneurOnFire into a top-ranked business podcast that generates a monthly income between $50 – $100k. During the 12 Days of Giveaways, you can get John’s ebook, Podcast Launch, for free. Not only will you get the the ebook, but this giveaway also includes 15 video tutorials! How’s that for a little holiday spirit? Even better, John guides you through the process of building your audience and monetizing, allowing you to turn your podcast into a business. Snag your free copy of Podcast Launch before the 12 Days of Giveaways ends. Simply enter your information here to tell us where to send your copy! 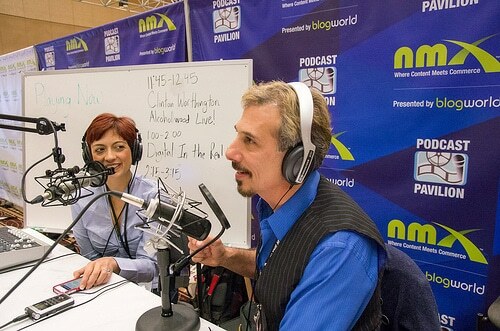 Once again we are thrilled to be giving the 9th Annual Podcast Awards ceremony a home at New Media Expo in Las Vegas on Sunday Jan 5, 2014. It’s an exciting night to celebrate podcasting and podcasters, and we look forward to meeting the many nominees and finalists in person! 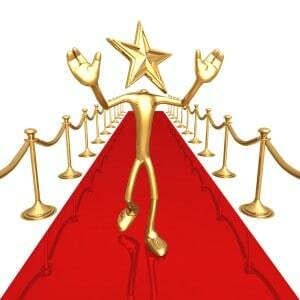 We want to extend an invitation to all of them to join us at the awards ceremony on January 5th, 2014. Since the people who nominated the shows are not required to provide the podcaster’s contact information, we’re unable to reach all 4,000 nominees directly. However, Podcast Connect has compiled a list of the finalists below and we would like to invite each of them to provide their contact information so we can correspond with them. Additionally, all 4,000 Podcast Award nominees who confirm contact info will be given a special discount to attend New Media Expo. How do you know if you are a nominee? Well if you or any of your listeners nominated you then you can consider yourself a nominee and we are providing an extra incentive to get you to the show! 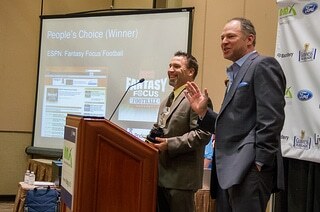 If you’re one of the nominees, we’re pleased to offer you a 30% on any NMX conference pass so you can attend our three-day event. A minimum purchase of an Exhibit Hall Only Pass is required to attend the 9th Annual Podcast Awards. If you’re one of the finalists below, we’d like to sweeten the deal and offer you a 50% discount on any NMX conference pass. Again, a minimum purchase of an Exhibit Hall Only Pass is required to attend the 9th Annual Podcast Awards. We hope you’ll join your fellow podcasters and other content creators at the conference and come congratulate the Podcast Award winners in person! Envision your podcast having an audience of 300,000 people a month. You are receiving so many requests for speaking engagements that need to hire someone who will simply manage your appearances. Your listeners are encouraging you to write yet another book on your subject. All of the big names in your industry know your podcast is the show on which to appear if they hope to get noticed. It is all possible for you. When I get you to envision the future in your imagination, I stir emotion. I give you hope. The story creates excitement. It is inspiring. Emotions are powerful. Audio in general is so much more emotional than video. You can be so much more powerful if you use audio correctly, because audio uses the power of the imagination to evoke emotions deep within the listener. Video is exactly what you see. When you and I watch video, we both see the exact same thing. There is no doubt about the color of a car in the scene. The weather is perfectly obvious. Your view of the surroundings is exactly like my perception. Every part of the scene is determined by the director. When you and I hear audio, most of the details are left up to our imagination. We hear a story and envision the details in our head. When you see the scene in your imagination, you create it in a way that gives you the most joy and benefit. I do the same. Our two visions may be very different. The storyteller may describe part of the scene, such as a back alley on a cool, damp night. If we saw that alley on video, you and I would see it exactly the same. If we hear about that alley, we envision the alley in very different ways. You may picture a very tight, dirty alley where the buildings are very tall. They alley is one car wide and strewn with dumpsters. The back doors of restaurants rhythmically line the walls of the buildings, like soldiers standing at attention. One street light hangs off a build halfway down the alley. The stench of old food fills the air. I might imagine that alley as a dirt path through a neighborhood between houses. Chain link fences lines the alley on both sides. As cars make their way down that alley, they are forced to dodge trashcans from the houses that have been set out for trash collection the next morning. The trail goes on through backyards for a few block before it ducks uphill behind the trees. The smell of wet grass fills the air. Those two scenes are quite different. We both envision our scene in a way that best suits our imagination, based on our own experiences. The mind is a very powerful tool. The imagination has the power to evoke emotions much stronger than any visual cue could ever do. Fear is simply your mind imagining what might happen. Inspiration comes when you imagine what the future might hold. One of the reasons for Alfred Hitchcock’s success as a movie director was his ability to stir the imagination. His scenes didn’t show all of the violent details. He may show a shadow while you hear the screams in the background. He might simply show a coffee cup while you only hear the struggle between the two characters. Your imagination makes the scene much more powerful, emotional, and believable than any scene he could show you. When you’re preparing to record your podcast, determine what emotions will make your listeners take action. Decide what you hope to make your listener feel. You want the stories you tell to help evoke those emotions. Use wonderful, vivid details within your story that will dance in in each listener’s imagination. You can activate the imagination of your listener by painting verbal pictures. Put your listener in the moment by asking them to imagine something, like I did at the start of this post. You are receiving so many requests to appear for speaking engagements that you are close to hiring someone who will simply manage your appearances. You can see the requests coming in. Are people e-mailing or calling you? I don’t know. That is the beauty of the imagination. If you prefer e-mail, you will envision people e-mailing you. If you like to talk to people on the phone, you can imagine people calling you. You will see in your mind the situation that is most beneficial to you. I only help you paint that picture. The power of storytelling comes into play when you stir emotions by painting verbal pictures in the imagination of your listener. For imagination to kick in, you have to start off with enough details first. Give listeners a base and then allow them to fill in the blanks. This is where audio and podcasting become the visual medium. The story comes to life visually in your imagination. 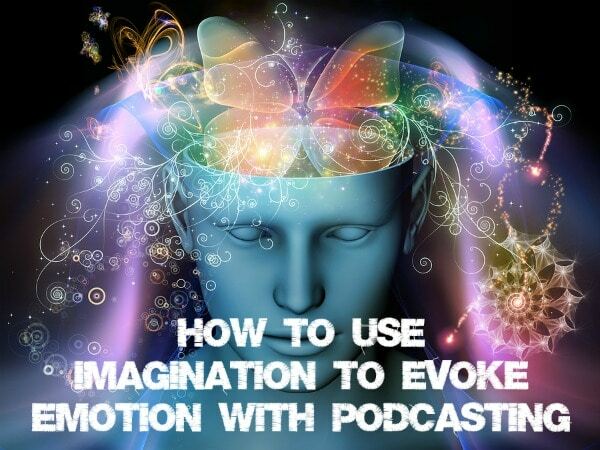 The imagination stirs emotion within the listener, and emotions are powerful for turning that first-time listener into a subscriber and turning that subscriber into a fan who will promote your show to his/her friends. Some podcasters out there are very good at painting visual pictures to evoke emotions. Share your favorites in the comments! 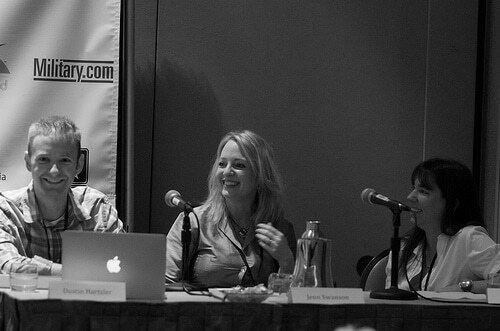 Okay, I have to admit it: After attending NMX 2013, I kind of want to start a podcast. About what, I don’t know, but the podcaster presence there rocked, and the Podcast Awards was one of my favorite parts of the whole show. I’ve been involved in podcasts in the past, but I never realized just how much I miss it. Podcasts can help you attract a new type of follower, expanding your audience beyond your current community. Podcasting often helps you improve your speaking skills, which allows you to get more speaking gigs and opens other opportunities to you. You can build loyalty with your voice that you don’t get with text, as it makes it easier for people to connect to you and trust you. Podcasting is not as hard as you think! With a podcast, you get the opportunity to talk to others in your niche, which helps you become a master of your subject. Podcasts are easy to consume, since you can listen in the car, at the gym, etc. You can recycle some of your best written content ideas by recording a podcast about these same topics. Podcasts allow you to tap into a new community. 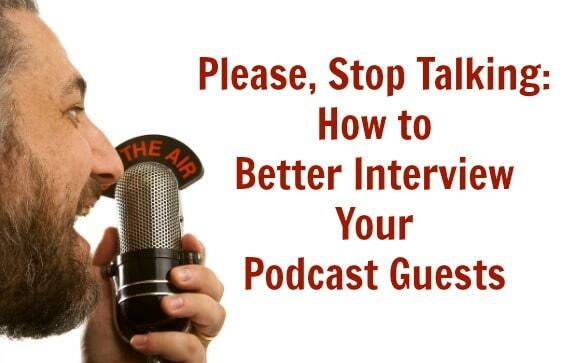 Having a regular podcast helps you improve perceived credibility. You can make money with a podcast. To their reasons, I would add one of my own: podcasts are fun! When I used to be part of a video game podcast with a few friends, recording together was one of the highlights of our week. 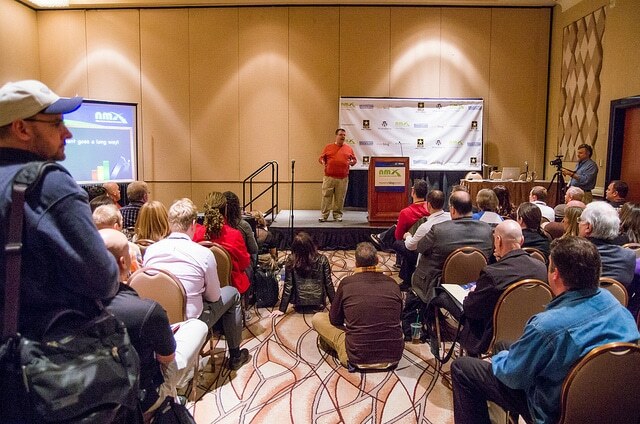 If you still aren’t convinced, I recommend checking out the entire presentation at NMX University via our 2013 Virtual Ticket, which also gives you access to this and dozens of other sessions, including a number of presentations that will help you get started podcasting. Bloggers, have you ever considered podcasting? Podcasters, what reasons can you add to this list? Would you like to create a deeper connection and relationship with your audience? There is one adjustment you can make to your podcast to help you achieve your podcasting goals. Whether you hope to motivate your audience to action, entertain them with a story or simply get them to listen again, one change to your approach can help you succeed. This small modification to your approach will have a big impact on creating a trusting relationship with your audience. Treat every listener as an audience of one. When creating a podcast, it is critical to your success to address each member of your audience as an individual rather than a group, regardless of the size of your audience. Your listeners are not engaged with your show as a group. They are each listening as individuals with unique imaginations. You need to treat them that way. 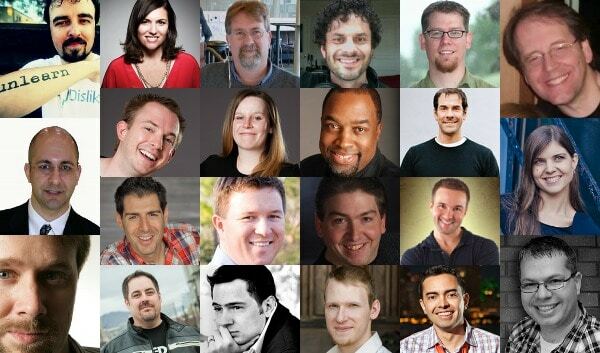 Addressing your audience as a group is impersonal. Your listener doesn’t feel special. 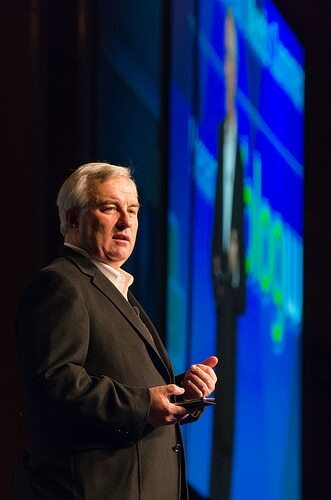 Speaking to a group allows each listener to feel like you are speaking to someone else. It is typical for your listener to feel like it’s alright to not take action, because another member of the group will handle it. This style began back when radio began. When radio broadcasting started, station owners needed something to broadcast. The content was typically stage performances broadcast over the airwaves. The “Ladies and Gentlemen” salutation was meant for the live audience in the theater. It was not intended for the listening audience at home. At the time, radio was the primary source of entertainment at the family home. Prior to the introduction of television, families gathered around the radio in the family room each evening for their entertainment. Addressing the audience as a group made sense. Listening was taking place as a group. As radio broadcasts moved from stage performances on the radio to “made-for-radio” dramas that were produced in a studio rather than on the stage, the salutations didn’t change. The live audience was no longer present. The audience however was still gathered together in the family room. The announcer continued to address the listening audience as a group, simply because it had always been done that way. When television was introduced to the family room, long-form radio programming moved to television. Great radio stories like The Lone Ranger, Abbott & Costello and The Green Hornet left the radio for the promised land of television. Radio was quickly being replaced as the nightly family activity in the home. Eventually, the radio performance was replaced with a disc jockey playing recorded music for the listening audience. Radios also progressed with the introduction of the transistor. Small, portable transistor radios took the place of the large console radios that once occupied the family room. Listening moved from being a group activity in the family room to being a personal experience with these portable radios. Even as listening changed, most on-air personalities continued to address their audience as a group. It had always been done that way. Today, podcast listening has become even more personal. Podcast listening typically takes place alone in a car or with headphones. People are no longer listening as a group. They are alone with your voice. Even if your listeners are with others while they are listening, each individual is creating unique images in their head. Those images are different from the images created in the imagination of any other person in the audience. Audio is a very personal medium. Since they are listening as individuals, you should address them as such. Your show should be a one-on-one conversation with your listener. If most of your listeners are listening alone, it sounds out of place when you say, “Hello, everyone.” Your listener is then saying in their head, “Everyone? It’s just me. Who are you talking to?” “Everyone” is directed at no one. Adjust your language to fit your audience. If I describe a car making a left turn at a busy intersection, you will envision it much differently than any other person listening to the same story. Television leaves very little to the imagination. 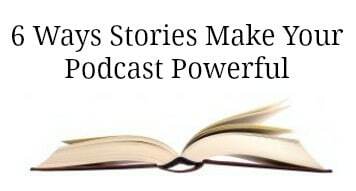 Audio helps create wonderful stories and stirs the imagination. The more personal and individual you can be with your stories, the stronger your connection and relationship will become. Finally, when you address a group, it is easy for your listener to shirk their responsibilities while expecting somebody else to take care of the tasks. Let’s say you want your audience to visit you website. You say, “I would really appreciate it if you guys would log onto my website this week and let me know what you think.” Who exactly do you want to take action? You’re addressing the entire group. I don’t need to do it. There will be plenty of others that take action. It won’t make much difference if I don’t do it. Unfortunately, most listeners are thinking the same thing. When you check your web stats, they’ve barely moved. Very few have taken action. Why? Because you didn’t address them individually. It was easy to assume somebody else would handle it. 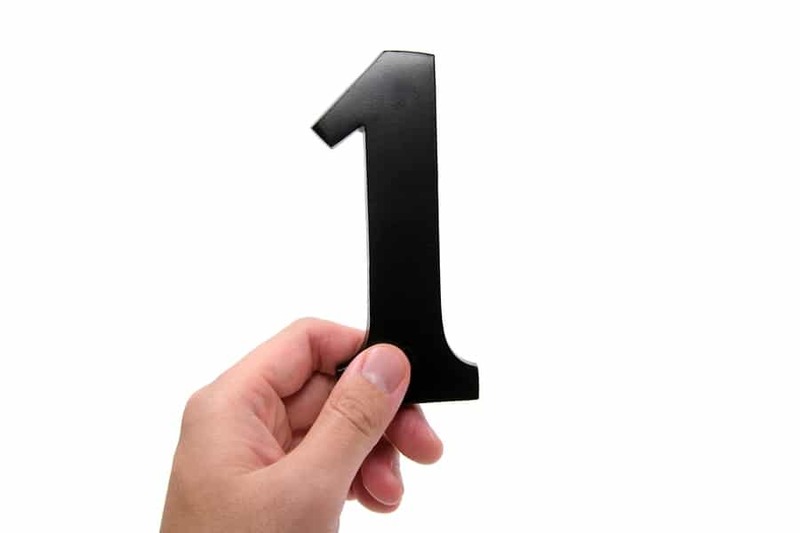 There are three steps to treat your listeners as an audience of one. First, get rid of the collective, group talk. Change your nouns and pronouns from plural to singular. Instead of using “ladies and gentlemen” or “you guys”, use “you”, “me” and “I.” Talk to one person. Most everything you say will apply to one person just like it will apply to a group of people. Second, be personable. Reveal things to your audience that you would reveal to your friends. When you have trust in your listener, she will begin to feel appreciated. Your relationships will become stronger and more meaningful. Third, be real. Speak like a real person and not an announcer. Replace announcer words with words real people use. Instead of using “good evening” like a network news anchor from 1975, use “hi” like you would use when you call a friend. If you hope to make your call-to-action effective, you need to create strong relationships with your listeners. If you want to create strong, meaningful relationships with your audience, you must treat each person in your audience as an individual. Make each listener feel special. Talk directly to them one-on-one. Use words that sound like you are speaking to one person. Be personable. Be real. Create wonderful relationships as you create multiple audiences of one.